A well-formulated mouthwash is needed to rinse away food missed by brushing, helps fight cavity causing critters and freshens your breath. Despite their usefulness for oral hygiene, some people have steered clear of them due to controversy over some ingredients, so we have been particularly careful to choose safe and natural ingredients that have a function other than just a minty rinse. Some things we avoided were alcohol (sorry adults it’s not good to swill that stuff), Benzalkonium Chloride, Parabens….well you get the idea. 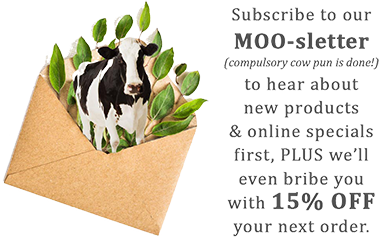 In fact rather than give all the “free froms” we at MooGoo like to show you everything we put in our products, not just the prettiest sounding ones. We list them all below on our website. Swish and gargle for around 30 seconds. That feels like a long time by the way. Spit out what’s left and feel the sensation of a mouth as fresh as an alpine forest. (We watched too many commercials in the 80’s). Great for children. Mouthwash is no substitute for brushing and flossing. But it can be great to use as a freshen up when at work after that morning coffee or before heading out. Aqua Believe it or not, that’s what we have to call water on a label. Aloe Leaf Juice A great ingredient for oral health. Want some evidence? Check out this study. Lactobacillus ferment A new ingredient technology using a ferment that naturally controls bacteria. Sea Salt Helps control bacteria when used as an oral rinse. Stevia Oil and Natural Flavour Helps ensure kids like the taste and is great for oral health. Thyme, Cinnamon, Myrrh, Sage and Clovebud Essential Oils An essential oil blend we have used in the past for controlling bacteria.